Data from Spirit's power subsystem indicated that some dust blew off the rover's solar array on the following day, Sol 1812 (Feb. 6, 2009). NASA?saging Mars rover Spirit has a bit more power under its hood thanks to some Martianwinds that cleaned dust from its vital solar panels. The handy cleaningoccurred earlier this month and was discovered by engineers scanning data fromSpirit?s power subsystem. "Wewill be able to use this energy to do significantlymore driving," said Colette Lohr, a rover mission manager at NASA'sJet Propulsion Laboratory (JPL) in Pasadena, Calif. "Our drives have beenaveraging about 50 minutes, and energy has usually been the limiting factor. Wemay be able to increase that to drives of an hour and a half." The lasttime winds scoured Spirit?s solar array clean was in June 2007, but a massivedust storm on Mars later that year piled new grit atop the rover, missionmanagers said. Thanks tothe recent Martian winds, Spirit?s daily power levels rose to 240 watt-hours,an increase of about 30 watt-hours, mission managers said. For comparison, 30watt-hours is the same amount of energy used by a 30-watt light bulb during onehour. "Itmay not sound like a lot, but it is an important increase," said roverteam engineer Jennifer Herman, who first discovered the power boost whilestudying data beamed home by Spirit on Feb. 6 - the rover?s 1,812 Martian dayexploring the red planet. Before thecleaning event, Spirit was generating about 210 watt-hours of power, with only25 percent of the available sunlight penetrating the dust layer coating itstop-mounted solar array. After the cleaning, the amount of sunlight gettingthrough jumped to about 28 percent. Spiritneeds about 180 watt-hours just to survive on the Martian surface and maintaincontact with its human handlers on Earth. The extra 30 watt-hours nearlydoubles the amount of power the rover now has for driving across Mars or usingits science instruments and robotic arm, mission managers said. 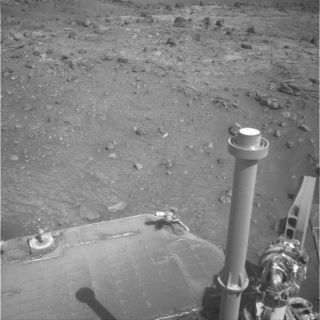 Spirit iscurrently rolling across a low, rocky plateau dubbed ?Home Plate,? which sitswithin the rover?s Gusev Crater landing site on Mars. Originally built for aplanned 90-day mission, Spirit and its robotictwin Opportunity have now spent morethan five years exploring their respective Martian landing sites onopposite sides of the planet. Both Spiritand Opportunity have suffered some aches and pains associated with theirunexpected longevity on the surface of Mars. Most recently, Spirit experiencedan odd bout of amnesia when it failed to record and report a day of activitiesto flight controllers on Earth last month. Spirit hassince recovered from the glitch and driven about 30 feet (9 meters) afterovercoming a stubborn rock that blocked its path in late January. Roverscientists hope to guide Spirit to the other side of its ?Home Plate? territoryin the weeks to come. On theother side of Mars, Spirit?s twin Opportunity is doggedly driving across theplains of its Meridiani Planum landing site as it heads towards a monstercrater called Endeavour. Last week, Opportunity drove about 446 feet (nearly136 meters) in one of a series of long hauls en route to the crater. The roverhas visited a several craters, each larger than the last, in its more than fiveyears of Mars exploration.